There were 3 Puscifer shows this weekend, (Friday the 13th, Saturday the 14th, and today (Sunday the 15th). There were UNIQUE posters for each show that are ONLY BEING SOLD ON THEIR RESPECTIVE NIGHTS. (meaning that if you went on Friday the 13th, you could only get the Friday the 13th poster … you could NOT get the Saturday or Sunday poster unless you went back to the concert on those nights as well). Regular Posters were $25.00 (unsigned), and there was a LIMITED number of AUTOGRAPHED SETS for $300.00 which included ALL 3 POSTERS, each signed by Maynard !!!!!!! The Merch booth told me that there were ONLY 20 OF THESE SETS AVALIABLE !!!! Links are worth checking if only to see what they look like. For those of you who missed the Signed Salival Sale the other day, and still have US$200 burning a hole in your wallet, a Collectors Set available at the CoSM website is for you. Featuring copies of the Vicarious and Parabola DVD signed by Adam, as well as the Revolver Tool issue signed by both Adam and Alex. Presumably limited so don’t miss out! 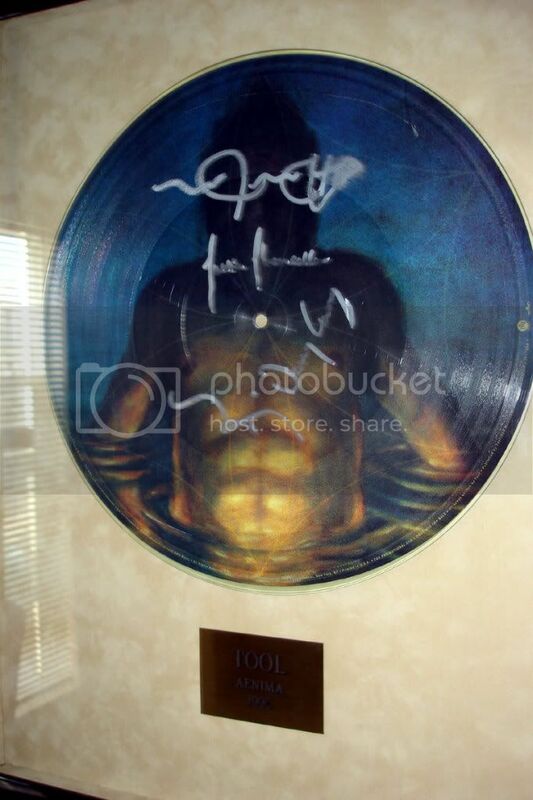 US Radio station Rock 1065 are auctioning a splash cymbal autographed by all four Tool member with all money raised going to the Kids First Of The Carolinas charity. If you’re in a giving mood, and want a piece of a signed drumkit, then check it out. Amer emailed me the other day, letting me know that he’s being forced to part with his signed copy of the “stupendously rare” (his words not mine!) Cesaro Summability picture disc. Apparently only 25 of these signed items exist in the world, so for you die hard collectors this sounds like a great opportunity to open your wallets and grab a copy. Current bidding on Ebay puts it at $222 + shipping, and the auction has another six days remaining. Amer mentions he’d rather this go to a genuine Tool fan rather than a re-seller, so check it out! A couple of little things today, Shinji from the French Tool website Salival has posted an interview he did with Buzz from the Melvins. Pictures from their recent show there can be found here. Also, George emailed me a link to a Craigslist/Ebay auction for an autographed bottle of wine, singed by Maynard and Eric. According to the post Maynard rarely signs stuff. I guess he wasn’t aware of the dozen or so signing sessions Maynard is attending at the Whole Food Markets. Bidding starts at US$49. A new Ebay sale featuring a guitar signed by Maynard is up and running with a Buy Now price of US$549. The guitar was signed by Maynard after the Grammy’s last year, and features a certificate of authenticity, so there’s a good chance it’s legit. Not sure what type of guitar it is, but based on the price I’d suggest it’s probably a Epiphone LP Copy, rather than a real Gibson.